Birth*: Mary was born circa 1820 in Nova Scotia, Canada. Language*: Walter Angus MacFarlane spoke Scotch Gaelic. [S100] Obituaries from The Casket Newspaper, 1852 - present, Obituary of MacFarlane, Walter Scott, 75-1927-14-8. [S275] April 23, 1901 Canada Federal Census, 101 Newbury Street, Boston, Suffolk, Massachusetts, USA. [S958] 1911 Canada Census, MacFarlane # 1864. [S9] Births, Church Record, June 1977 to September 1944 St. Joseph's Church, Margaree, Records, page 40, line 5. Biography*: The 1881 Census lists Christy as in school. The 1901 Census says Christy could both read and write. [S303] Joanie Perry, "Perry, Joanie, MacFarlane, Don," e-mail to Don MacFarlane, February 21, 2001. Chapter XV - Loch Ban and North Ainslie. [S377] April 12, 1901 Canada Federal Census, 101 Newbury Street, Boston, Suffolk, Massachusetts, USA. [S405] April 13, 1881 Canada Federal Census, 101 Newbury Street, Boston, Suffolk, Massachusetts, USA. [S709] Diocese of Antigonish, Nova Scotia, Canada , Baptismal record of John Angus MacFarlane, page 3. [S709] Diocese of Antigonish, Nova Scotia, Canada , Baptismal record of Janet MacFarlane, page 8. [S709] Diocese of Antigonish, Nova Scotia, Canada , Baptismal record of Donald Lawrence MacFarlane, page 9. [S709] Diocese of Antigonish, Nova Scotia, Canada , Baptismal record of Michael MacFarlane, page 9. [S709] Diocese of Antigonish, Nova Scotia, Canada , Baptismal record of John Arthur MacFarlane, page 11. [S709] Diocese of Antigonish, Nova Scotia, Canada , Marriage record of John C. McFarlane and Christina J. Kennedy, page 136. [S108] Letter, Blanche H. MacFarlane to Donald J. MacFarlane (7), July 1, 1996. [S565] Michael MacFarlane, MA Death Registration for # 2119. [S873] 1921 Canada Census, McFarlane # 2072. [S861] Ancestry.com, online www.ancestry.com, http://search.ancestry.com/cgi-bin/sse.dll,%20canada&msbpn=5005&msdpn__ftp=nova%20scotia,%20canada&msdpn=5005≠w=1&rank=1&redir=false&gss=angs-c&pcat=BMD_DEATH&h=14158929&dbid=60901&indiv=1&ml_rpos=41. in theU.S., Social Security Applications and Claims Index, 1936-2007. [S861] Ancestry.com, online www.ancestry.com, 0861 - 2117g - John Angus MacFarlane.docx. [S709] Diocese of Antigonish, Nova Scotia, Canada , Baptismal record of Catherine Mary MacFarlane, page 7. [S861] Ancestry.com, online www.ancestry.com, Daniel Lawrence MacFarlane in theU.S., Social Security Applications and Claims Index, 1936-2007. [S709] Diocese of Antigonish, Nova Scotia, Canada , Baptismal record of Mary Catherine MacFarlane, page 12. [S531] MA Marriage Registration # 2118 & 4890. [S709] Diocese of Antigonish, Nova Scotia, Canada , Marriage record of Alexander Edward Kennedy & Cath Ann Cameron, page 312. [S709] Diocese of Antigonish, Nova Scotia, Canada , Birth record of Michael Kennedy, page 315. [S709] Diocese of Antigonish, Nova Scotia, Canada , Birth record of Catherine Kennedy, page 316. [S709] Diocese of Antigonish, Nova Scotia, Canada , Birth record of Christine Kennedy, page 317. [S709] Diocese of Antigonish, Nova Scotia, Canada , Birth record of Christy Kennedy, page 315. Name-Comm: His common name was Dan Larry. Daniel Lawrence MacFARLANE, 90, Broad Cove Marsh, died Saturday, December 12 at Inverness Consolidated Memorial Hospital. 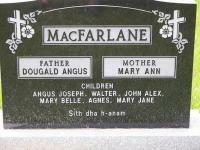 Born at Margaree Island, he was the son of the late John C. And Christine (KENNEDY) MacFARLANE. He was a member of St. Margaret’s Church, Broad Cove and a member of St. Peter’s Council K. O. C., Port Hood, for 69 years. Mr. MacFARLANE served on the municipal council for 19 years. He is survived by one son, Thomas, Boston; one sister, Catherine, Vancouver; and one brother, Michael, Boston. He was predeceased by his wife the former Margaret MacDONALD; one sister, Sarah and four brothers, John Arthur, Angus, Alexander and Albert. [S861] Ancestry.com, online www.ancestry.com, 0861 - 2107 - Donald Lawrence MacFarlane.docx. [S427] CBGHA, online www.cbgha.org, Excerpts from 2005-05. [S861] Ancestry.com, online www.ancestry.com, http://search.ancestry.com/cgi-bin/sse.dll,%20canada&msbpn=5005&msdpn__ftp=nova%20scotia,%20canada&msdpn=5005≠w=1&rank=1&redir=false&gss=angs-c&successSource=Search&_phtarg=tVE1346&pcat=BMD_DEATH&h=9478119&dbid=60901&indiv=1&ml_rpos=42. Biography*: The 1901 Census says John could both read and write. [S232] South River, John Cameron & His Descendants, November 20, 1913. [S262] Dr. Raymond A. MacLean, History of Antigonish, Volume 2, Page 91, note 28. [S819] Letter, Gary M. MacDonald to Donald James MacFarlane, March 2014. Married Name: Her married name was Murdoch. Birth*: Christena was born circa 1770 in Moidart, Inverness-shire, Scotland. Married Name: As of 1809,her married name was Cameron. [S100] Obituaries from The Casket Newspaper, 1852 - present, The obituary of Angus A. Cameron, 64-1916-30-5. Biography*: The 1901 Census says Angus could read. [S861] Ancestry.com, online www.ancestry.com, 0861 - 2117e - John Angus MacFarlane.docx. [S529] National Archives and Records Administration Naturalization Petition, 756656, on Certificate of Arrival (December 10, 1943), Waltham, Middlesex, Massachusetts, USA. [S914] Donald James MacFarlane Border Crossing Card, 1329503 (Oct 21, 1920), Meredith, Belknap, New Hampshire, USA. [S861] Ancestry.com, online www.ancestry.com, 0861 - 2117f - John Angus MacFarlane.docx. [S861] Ancestry.com, online www.ancestry.com, http://search.ancestry.com/cgi-bin/sse.dll,%20canada&msbpn=5005&msdpn__ftp=nova%20scotia,%20canada&msdpn=5005≠w=1&rank=1&redir=false&gss=angs-c&pcat=BMD_DEATH&h=112132494&dbid=60525&indiv=1&ml_rpos=34. [S861] Ancestry.com, online www.ancestry.com, 0861 - 4898g - William Francis MacFarlane.docx. Name-Comm: His common name was Alex H.
[S532] Bruce MacFarlane, Birth Registration 12235 (October 5, 1938). 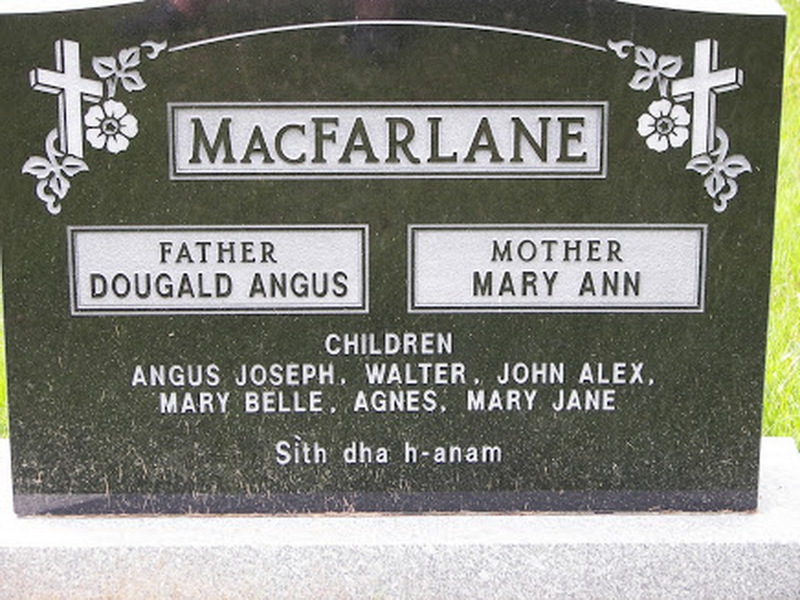 [S533] Donald MacFarlane, Birth Registration 12234 (October 5, 1938). [S534] Alexander Howard MacFarlane, Birth Registration 13359 (November 8, 1936). [S913] Donald James MacFarlane Border Crossing Card, 0200-K-11224 (November 12, 1925), Meredith, Belknap, New Hampshire, USA. National Archives and Records Administration (NARA); Washington, D.C.; Book Indexes to Boston Passenger Lists, 1899-1940; Microfilm Serial: T790; Microfilm Roll: 90. [S506] Robert Joseph Gillis, Two Gillis Families, page 215. [S564] Alexander Howard MacFarlane, MA Death Registration for # 2118. Biography*: Michael was born on Sea Wolf (Margaree) Island where his father was keeper of the light. [S861] Ancestry.com, online www.ancestry.com, 0861 - 2120 - Albert Allan MacFarlane.docx. [S506] Robert Joseph Gillis, Two Gillis Families, page 214. [S818] J. R. Reid, Descendants of Angus MacLellan # 8701, page 34. Name-Gaelic: John MacLellan was also known in Gaelic as Iaian MacColum. [S1] J. L. MacDougall History of Inveness County, page 89. [S29] April 6, 1891 Canada Federal Census, 101 Newbury Street, Boston, Suffolk, Massachusetts, USA. Married Name: Her married name was Coady. [S127] The Casket, Parish of SW Margaree, 1896, page 7. Death*: Mor died in Nova Scotia, Canada. Marriage*: She married (?) MacLellan. Married Name: Her married name was MacLellan. Birth*: Mor was born circa 1750 in Inverness-shire, Scotland. Marriage*: He married Mor Nigh'n Laia 'ic Uilleam Gillis. Birth*: (?) was born in 1750 in Inverness-shire, Scotland. Birth*: Mary was born in 1770 in Inverness-shire, Scotland. Death*: Mary died in 1840 in MacDougall's Graveyard, Margaree, Inverness, Nova Scotia, Canada. [S1] J. L. MacDougall History of Inveness County, page 407. [S403] April 18, 1881 Canada Federal Census, 101 Newbury Street, Boston, Suffolk, Massachusetts, USA.